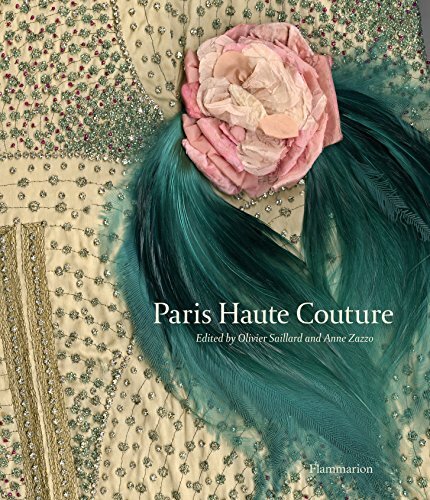 Paris Haute Couture is possibly one of the most informative and exhaustive volumes on the subject. Ms. Zazzo has compiled the most amazing history of the haute couture starting with Charles Worth and taking us to present day. Very few aspects of this area of fashion have not been examined and explained. Every facet of this rarefied world is covered from start to finish whether the subtopic is labels, perfumes, house practices, perfumes, buttons, ateliers or designers. There is so much to be learned from this book and there are few who would claim to have known all of these facts before its reading. So many books that claim to be comprehensive do not come close to this “study” of this area of fashion history as Ms. Zazzo offers up names of designers who are rarely included in the usual cast of characters as well as aspects of this world that are never addressed. The physical presentation of the book are equally incredible, as the photography and reproduction quality are superb to the point of unsurpassed clarity. Inadvertently this reviewer caught himself running his finger over the photograph as if to feel the incredible detail in front of me. Having reviewed over one hundred fashion related books, I never before had that reaction and am reasonably sure I won’t again anytime soon. This is a book that truly deserves a place on the shelf of everyone who has more than just a fleeting interest in fashion as well as those who want to know more about the origins of fashion as we know it today. Those who have a thirst for the knowledge on the subject fashion will be overwhelmed with Paris Haute Couture’s equal offerings of entertainment and education.